Specialized material handling equipment like drum handlers, pallet stackers and pallet trucks are the answer for improving efficiency and safety in your facility. We have product handling solutions to transport materials and pallets any distance and height. To safely lift, move, pour, weigh and rack drums, our specialized barrel and drum handlers make the job easy and efficient every time. Your warehouse workers will thank you for the ergonomic benefits and you will quickly see the productivity improvements. 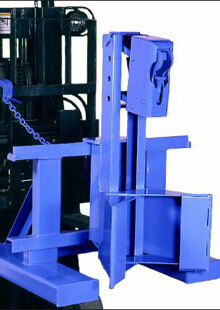 Pallet Stackers provide the best solution when your transport needs include lifting and stacking of pallets. Pallet Trucks are the best solution to transport pallets any distance. We offer pedestrian trucks for short distances, stand-on pallet trucks for medium-range operations, and seated trucks for longer distances. Call a McKinley Equipment vertical lift solutions expert to determine the best handling equipment for your needs. We also offer installation and repair service for all brands of material handling equipment.